(Nanowerk News) Recent observations from April this year of the galactic centre have revealed that parts of the in-falling gas cloud, which was detected in 2011, have already swung past the black hole at the heart of our Milky Way. Due to the tidal force of the gravity monster, the gas cloud has become further stretched, with its front moving now already 500 km/s faster than its tail. The findings confirm earlier predictions: the cloud will come so close to the black hole in the course of the next year that it will be completely torn apart. With the new, detailed observations, the astronomers from the Max Planck Institute for Extraterrestrial Physics can now also place new constraints on the origins of the gas cloud - it seems increasingly unlikely that it contains a faint star inside, from which the cloud might have formed. Series of infrared images showing the central region of our Milky Way galaxy. The gas cloud (indicated by an arrow) is unambiguously detected up to 2012, in the latest images however its surface brightness is too low for a firm detection. In 2011, MPE astronomers detected a gas cloud that is falling towards the black hole at the centre of our Milky Way on a near radial orbit. New, very sensitive data were taken in April 2013 with the SINFONI instrument at the ESO Very Large Telescope and have now shown that part of the cloud has already passed its closest approach to the black hole. As the gas swings by the black hole, it reverses its velocity. The emission from this part of the cloud appears not red-shifted as does the radiation from the rest of the cloud, but rather blue-shifted. Previous estimates of the gas cloud orbit had predicted the nominal pericentre passage for later in the year, while the new analysis prefers a date early in 2014 – a difference that is less than the duration of the event. In addition to the new observations, the team also re-analysed archival data, and can now give a better measurement of the cloud’s orbit. The fastest components appear to move with a red-shifted velocity of 3000 km/s (or about 10 million km/h), while the brightest part of the head moves with about 2180 km/s. Further down the orbit, there seems to follow a tail, moving much slower with a velocity of only 700 km/s but along the same orbit. 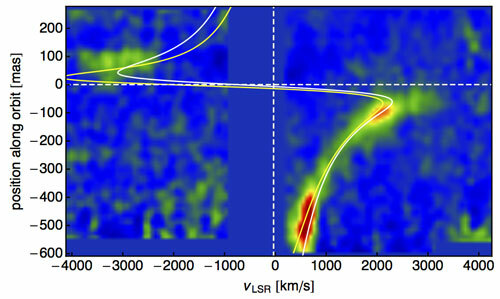 A position-velocity diagram of the gas cloud extracted from the latest observations with SINFONI. The spatial axis marks the direction along the orbit, the other gives the measured velocity at each point. A small part of the cloud can already be seen past the pericentre to the black hole (top left-hand side) while the head and tail structures of the gas cloud are still on approach. The two lines indicate orbits calculated on the basis of two different assumptions. “But the most exciting detection is gas emission with a blue-shifted velocity of 3000 km/s along the orbit at a position after pericentre,” says Stefan Gillessen. “This means that part of the cloud have already passed the closest approach to the black hole. This could also affect our models of the gas cloud orbit, as the brightest part of the head structure might not be comparable any longer to the head in 2012.” Measurements of the radial velocity seem to confirm this suspicion: The increase in velocity seems to be less than expected because the fastest particles have already moved to the other side of the black hole and thus no longer contribute to the velocity of the still red-shifted part. In addition, the new data also shed light on the enigmatic origin of the gas cloud. Several options have been proposed, ranging from recent formation due to a collision between stellar winds and the interstellar medium or the possible jet emerging from the galactic centre to a faint star that loses increasing amounts of gas. While the compactness of the gas cloud seems surprising for any of these scenarios, the shape of the tidal shear argues against models with a stellar core that would constantly supply new gas. Instead, the orientation of the orbit continues to favour an origin connected to the disk of young, massive stars surrounding the black hole further out. Numerous observing campaigns have been set up to monitor the region around the galactic centre intensively in 2013. This should provide the astronomers with a wealth of data, further constraining the parameters of the gas cloud but also giving interesting information about the surroundings of the black hole. The growing extension and the correspondingly decreasing surface brightness of the gas, however, will make such a detection difficult. The gas cloud is fading as it passes around the black hole.